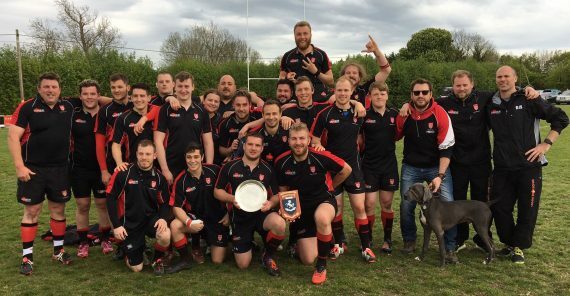 This Kent Plate final threw up a local derby between two sides whose differing fortunes meant they had not clashed in the last couple of seasons as the county town club faced near neighbours Aylesford who had come from behind to shock higher placed Beckenham in their semi-final. With the match played in fine conditions but with a blustery wind blowing down the pitch, giving due respect to their opponents Maidstone’s intention was to exploit their superior skillset and play the match by maintaining a high tempo. 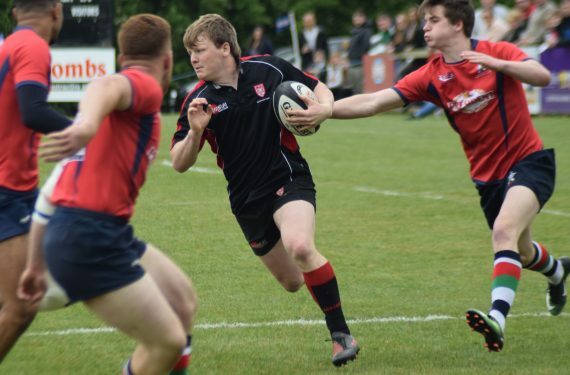 This they achieved and in reality the match was effectively over as a contest by the half hour mark as they ran in ten tries to win in convincing fashion, despite two late consolation scores to the opposition, with a 58-14 scoreline. Maidstone’s line up was somewhat different to that which had appeared in many of their league outings this season, skippered by Josh Pankhurst in the absence Ben Williams, a rejigged 2nd row the side featured Tom Chandler and saw the experienced Matt Iles alongside him. The back division also saw changes, with Josh Smith on the right wing as Rory Beech moved into the centres and Alex Clark filling the full back slot as Euan Caborn occupied the pivot at flyhalf. From the kick-off Maidstone’s will to play a fast and open game was apparent as they turned the ball over almost immediately and started to exert pressure in the Aylesford 22m, a quick lineout by Lucian Morosan saw the ball moved left with Cook thwarted close to the line although quick ball saw skipper Pankhurst able to power over on the 15m line for the opening score and his first of four first half tries. The second came five minutes later following a scrum midway out on the left after Nathan Simpson was held up over the line, the initial drive by Ben Brill was held but quick ball saw Pankhurst on hand to cross just to the right of the posts, Caborn reliably added the extras for a 10- lead. The restart saw Maidstone penalised on their 22m line in front of the posts but saw an early opportunity for Aylesford to get on the scoreboard spurned as Comerford’s attempt drifted to the right of the posts. The end of the first quarter saw probably Aylesford’s only real chance of the half as Comerford intercepted a lazy Maidstone pass on halfway, having turned the defence an inexplicable fumble with only the line in front of him saw the opportunity disappear. Maidstone rubbed salt in the wound two minutes later as they pounced on loose ball in midfield and moved it quickly to the wide left with Matt Moore outstripping the cover to cross and dot down under the posts, with Caborn predictable adding the extras. A period followed where Maidstone indiscipline saw them concede a string of penalties and free kicks, allowing Aylesford to exert some pressure on the Maidstone line; however their inability to generate quick recycled ball saw them unable to create the required tempo to stretch an organised defence and the attack petered out as Maidstone cleared their lines. A break from midfield on the half hour then saw Pankhurst complete his hat-trick when quick hands saw him hit the line at pace to run in from the halfway line. As half-time approached Maidstone were reduced to 14 as Caborn uncharacteristically received a yellow card for a reckless tackle but it was Maidstone who were to have the last say before the interval as they capitalised on a good lineout to drive at the Aylesford line and despite some good defence initially Pankhurst was able to cross for his fourth score of the match, Moore took over the kicking duties in what was the last act of the half to take the score to 33-0. The start of the second half went much the same way as the first with Maidstone touching down again after quick ball saw Rory Beech make the initial break in midfield to feed Cook who was able to outpace the defence and touchdown 5m in from the right touchline after only 2 minutes to extend the lead. 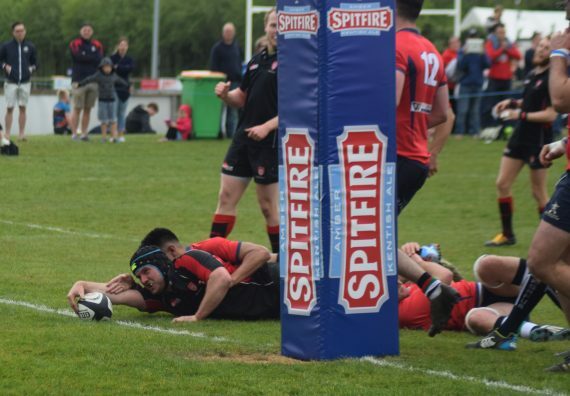 This was further extended midway through the third quarter as Matt Iles made a penetrating break from a lineout on the Aylesford 22m, only to be hauled down just short of the line, with Nathan Simpson on hand for the recycled ball to burrow over for the try. With Caborn returning to the fray Maidstone started to make changes, Martin Maytum had already come on at halftime in the front row, and Dan Fisher, Jack Johnson and Harry Cole would all feature at various points. However, no sooner was Caborn back on when Maidstone transgressed again with Maytum receiving a yellow card following a front row scuffle. Maidstone appeared to go off the boil at this points and it wasn’t until approaching the 60 minute mark that they troubled the scoreboard again, when a good move from a midfield lineout saw quick ball moved through the backs to josh Smith on the right wing, and whilst his run for the line was thwarted, a good inside ball to the supporting Beech saw the scoreline extend to the half-century. Aylesford responded with a try of their own in what was probably their first visit into the Maidstone 22m in the half as they managed to burrow over to the right of the posts, with Comerford adding the extras to reduce the deficit. A second score followed shortly after when slow recycled ball saw Comerford make a good kick wide to the left, with the covering Smith misjudging the kick and losing his footing the winger was able to pounce top cross in the corner with Comerford adding the extras from a difficult kick. The two scores seemed to spark Maidstone back into life for the closing minutes, first when a poor Aylesford clearance kick was fielded by Moore just outside his own 22m, a weaving run took him into the Aylesford 22m before he fed the ball to Smith wide on the right to cross in the corner and bring up the half-century. The match was capped off with one further score as Moore pounced on loose ball on his own 22m to make the initial break before feeding Matt Iles who was left with the little matter of a 2nd Row galloping in to score from 50m out. 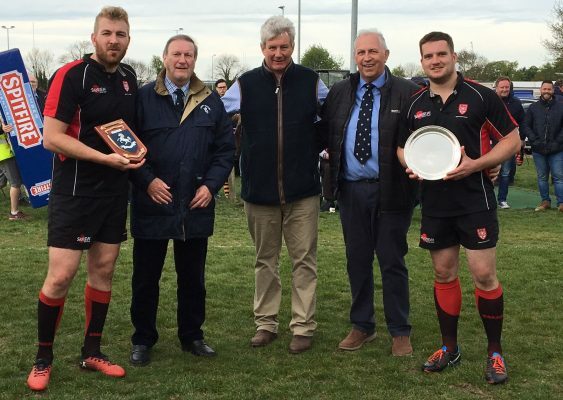 The conversion was unsuccessful and brought the score to a convincing 58-14 as the final whistle blew and saw the county town club retain the Kent Plate trophy for a second year. In summary, Maidstone achieved what they set out to do in winning the contest by controlling possession and keeping tempo in the game, and whilst there was two divisions difference between the sides, the match was a prime example of one of the basic tenets of the game, in that ‘quick ball is king’. This entry was posted	on Monday, May 1st, 2017 at 5:00 pm	and is filed under Other Sports, Rugby. You can follow any responses to this entry through the RSS 2.0 feed. Both comments and pings are currently closed.